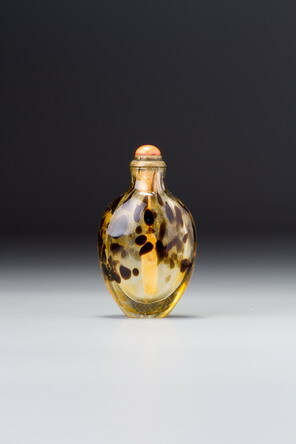 It is rare to find dishes matched to bottles where one can be reasonably sure that the two were originally intended to be used together. The material here, however, is so unusual and so distinctive that it seems highly likely. Not only is the jadeite of an extremely rare material as far as colour is concerned, but darker, metallic-looking flaws in the green inclusions in both specimens have created identical problems for the polisher in that they would not accept the same finish as the paler matrix, leaving duller areas. 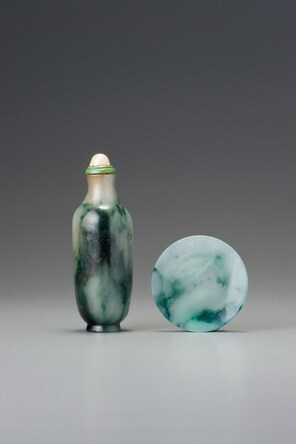 On the introduction of Burmese jadeite as a material for snuff bottles, see Sale 1, lot 32.